Born in March 1693 in Yorkshire, England, Harrison was son of a carpenter. He became a craftsman and a local choir director. Harrison made his first pendulum clock before he was 20 years old; like others he built in 1715 and 1717, it was made almost entirely of wood. Another clock, still working, was built by Harrison in a tower in Brockelsby Park where it runs without oiling, an advance unheard of before his design but that would prove to be an enormous advantage for a clock built to work at sea. With his brother James, Harrison also built clocks tuned to the positions of given stars. These timepieces were accurate within one second per month—the world’s best watches of his time were off by 60 seconds per day. A prize of 20,000 pounds offered by the British Parliament encouraged him to try to build a different kind of clock that could perform at sea. The problem of accurately calculating longitude had stymied the scientific community (including ISAAC NEWTON and EDMOND HALLEY) and loss of lives and cargo were high costs to maritime nations. Although latitude can be gauged by the height of the Sun or by specific guide stars, longitude, or meridian, is best determined by precise knowledge of the difference in time aboard ship compared to time at a place of known longitude (home port, for instance) at the same instant. Each hour’s time difference represents 15 degrees longitude east or west of the starting point and, in conjunction with latitude, can be used to determine a ship’s position relative to its destination. Without an accurate method of determining longitude, sea captains often traveled longer routes than necessary and/or crashed on unanticipated landfalls. A single disaster from miscalculation of longitude in 1707 resulted in 2,000 British sailors and four warships lost about 20 miles from port. 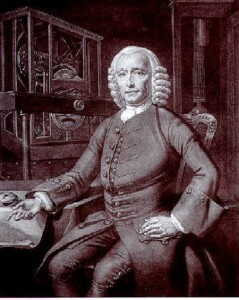 Parliament responded with the Longitude Act of 1714, which provided support for selected inventors plus a grand prize for a successful chronometer. From 1730 to 1760 Harrison built five non ­pendulum clocks with innovative counter­balanced, spring­ driven works. The first one was submitted in 1735 for the Board of Longitude prize, as were subsequent smaller instruments. In 1762 Harrison’s fourth version of a chronometer was in error by only five seconds during a six week voyage to Jamaica, but he was given only 5,000 pounds in 1763. Only after King George III himself intervened in 1773 was Harrison paid in full. Harrison died in London on March 24, 1776. Harrison’s ingenious chronometers were built without using astronomical methods that most educated people assumed would underlie success in measuring longitude at sea. His knowledge of various woods and non ­rusting metals and his superior craftsmanship contributed to successful designs of marine chronometers. His inventions saved time, lives, and cargo and thus helped Great Britain become the richest mercantile country in the world. Captain Cook used a Harrison chronometer to make the first, and highly accurate, chart of the South Sea Islands during his second voyage, which ended in 1775. Other watchmakers improved on Harrison’s models. John Arnold finished several hundred chronometers including a pocket­ sized one completed in 1779. He opened a factory to mass produce them in 1785. Thomas Earnshaw refined the chronometer further, reducing both its complexity and its size. As naval vessels, merchant ships, and pleasure yachts began to rely on chronometers as navigational necessities, the world census of chronometers swelled from just one in 1737 to about 5,000 in 1815. When the Beagle set out in 1831 with a mission to determine longitude of foreign lands, she had CHARLES DARWIN and 22 chronometers aboard. Modern sailors have atomic clocks, global positioning satellites, and multiple communications systems to help them make quick and accurate determinations of longitude. 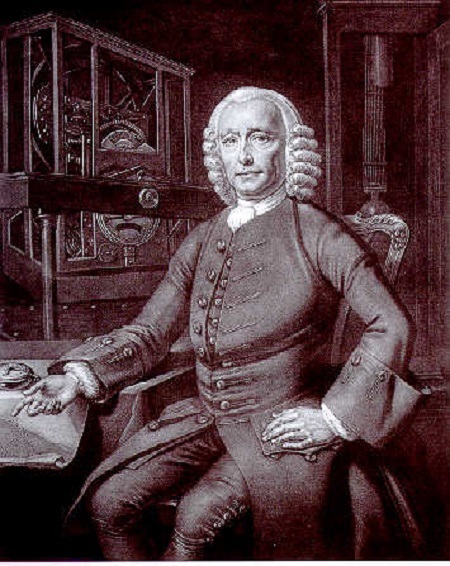 John Harrison’s inventions were the life­saving predecessors to these twentieth­century advances.